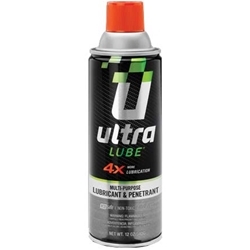 Ultra Lube 10444 Multi-Purpose Lubricant & Penetrant 12oz can. Lubricant and Penetrant has a naturally higher viscosity index than petroleum-based products, allowing it to more effectively reduce friction, heat and wear. UltraLube® works wonders for hundreds of different applications – from industrial requirements in the workplace to simple uses in and around the home. Use it to penetrate rusted and sticking parts, or to lubricate sliding parts, rollers, chains, hinges, doors, windows – almost anything you have that sticks, squeaks, binds or needs to slide smoothly.